1. Modeling Your Own Temperature Scale to Develop a Linear Equation. Chemistry software packages developed to enhance the teaching atomic theory are mostly static in nature. Chemistry is based on: where are the electrons in the atom? and were they are electrons missing. Biology faculty typically teach the satellite model of the atom suggested by Bohr in 1913 with electrons orbiting the nucleus in energy levels. The quantum mechanical model of the atom rejects the satellite model for a probability model. Electrons are found in sub energies levels call orbitals starting at the nucleus and occupying regions of space outside the nucleus. These orbitals are labeled s, p, d, f; named after the observed line spectra (sharp, principle, diffuse, and fine spectra lines). The orbital model demonstrates that electrons are found in pairs making the easy transition to the bonding concepts of electron pairs. The orbital diagram displays circles or squares with arrows representing electrons. The arrows are pointing up and down to represent opposite spinning electrons. Chemistry students must be able to place the electrons in the various orbitals to discover the element’s bonding characteristic. Using the orbital model rather than the shorthand model which resembles mathematics (1s22s22p63s23p3 ), students have a pictorial concept (although abstract and symbolic) of the electron building blocks of the atom. This software has two separate files. The first file (e_confsq.tbk) allows the student to push a button and the electrons are sequentially filled and a scrolling window displays the element represented by each electron arrangement. The filling sequence is displayed as well as the Hund` Rule of addition (half filling similar subenergy orbitals before pairing the electrons in the orbital). Special attention is taken to show the s-orbital to d-orbital shifting which occurs when there are four or nine d electrons in periods 4, 5, and 6 of the periodic table. The first screen demonstrates the first 18 elements (the first three rows of the periodic table). The next screen demonstrates the fourth row of the periodic table (elements 19-36). The third screen displays the fifth row of the periodic table (elements 37-54). The fourth screen demonstrates the six row of the periodic table, including the 4f orbitals. The orbital arrangement is then related the to periodic chart on the final two screens. The second file (e_confxe.tbk) allows the student to interact with the orbital diagram by placing the electrons on the screen by right or left clicking the mouse. Electrons may be removed from the orbitals also by right and left clicking of the mouse. The student selects an element by highlighting the element in the scrolling text field. The electrons are added to orbitals by the student, then a button is pushed to check the graphical objects on the screen. The product is distributed in runtime files. The software was developed in Asymetrix Toolbook,. The setup of three disks (or one CD) allows the user to run the files on their machines with runtime version of Toolbook. The product is distributed free to schools and individuals who purchase CHEMiCALC through the Chemical Concept Corporation. The electron configuration files, the polyatomic ion files, and electron dot molecular structure files supplement CHEMiCALC. However, with the growing use of the Internet, these products are now deployed on the Internet except they require a plug-in, Neuron, to run. The software developer is the certified trainer for Hillsborough Community College’s Click 2 Learn ATC Training Center for the west coast of Florida as well as the first chemistry instructor employed by the college in 1969. The application for beta testing was developed for college chemistry students to review the spelling of 54 of the common chemical elements, atomic numbers 1 through 92 used in college chemistry. The above URL will show that the student has three chances to spell the element correctly and that specific images are placed on the screen to accompany each element. In addition to the chemical symbol image, a second image is a photograph of the actual element. It also utilizes cascading style sheets for the form entry boxes. The results are sent to the instructor as an email. A sample report is attached. In addition to the total score, the incorrectly spelled elements are listed to identify common student errors. In response to the Florida election crisis in November 2000 the author developed a 50 state spelling test of the states using the unique random template, which includes two images of each state. One image shows the position of the state in the United States, while the second image shows the state with its state flag and major cities including the Capitol. The quiz may be found at http://www.fccj.us/Geography/states/states50pa.html The template may be used for many purposes and it is given free to educators for their application use on the Web. This package is an advanced programmed template, requiring a person to work in a HTML text editor. Teachers with less HTML experience may also use a free testing template, which utilizes multiple choice, true/false, and fill-in-the blank with an on-line grading mechanism. Due to circumstances beyond my control, I became a high school dropout, or rather a drop-up at the age of 17. I was at Little Rock Central High School. I was in my junior year amidst the crisis between the State of Arkansas and the Federal government. At age 17, the State deprived me of my senior year experience. I was one of 3866 students put on the street that year when, in order to avoid integration, the State and the City of Little Rock declared high school education in Little Rock illegal. After six months, I was one of 64 of the students on LRCHS’s 535 seniors admitted to the local university without a high school diploma. I went from an honor student in high school to a struggling B/C college freshman, attempting to survive in a university without the proper preparation. I am grateful for the opportunity that was given me by the university, but my undergraduate experience could have been a lot easier if the community college systems of today were available to help my transformation from 11th grade to college. Since then I have devoted my life to education, especially community college chemistry education where under-prepared adults come for a second chance to attempt post secondary education in a caring environment. I believe in the Open Door. I believe in designing instruction and experiences to take students from where they are, and bring them up to college level preparation, able to matriculate through two solid years of a college parallel or vocational education program. 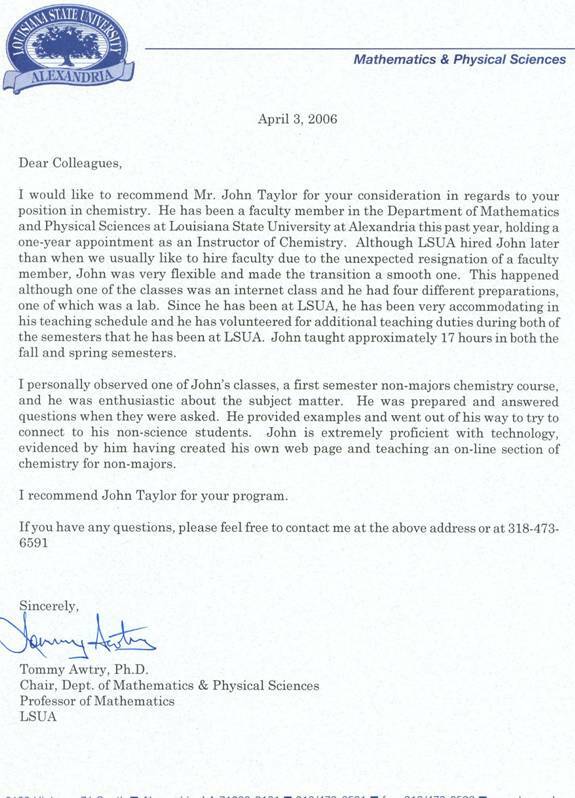 At LSUA my primary role has been to provide Introductory Chemistry (CHEM 1001) to the pre-nursing students and provide the Organic-Biochemistry course (CHEM 2414) for the four year BSN programs at the local universities, which are my specialties. The student is at the center of everything I do. I have strived for most of my life to help students succeed. I am constantly trying new ways to help today’s student. I hate faculty who teach and leave, who do not care about their students. Every student who does not succeed I take personally. I take pride in the fact that I have participated in every graduation Hillsborough Community College has ever through 2005 and look forward to the LSUA graduation in May 2006. I have a hard time understanding my peer faculty who do not get enthusiastic about finally seeing their students graduate and move on to their higher education pursuits. The community college is the second chance for these adults who now understand the value of the education that they may have wasted in K-12 many years ago. It was the perfect place to teach for my first career. Advanced classes like organic and analytical chemistry are easier to teach because the students have been “weeded out”. These classes have two semesters of general chemistry to filter unsuccessful students. I worry about those “weeded out” students. These students have been at the center of my mission. They are the ‘29 year old adult manual labor worker’ or the ‘30 something’ house mother whose children are now in school’, who comes to you and want a second chance to now achieve an education where as they wasted their first opportunity as teenagers in secondary schools. These students present the real challenge to teach and are often labeled non-traditional students. They probably do not have the skills to succeed, but they possess the characteristic most necessary to get started. They are motivated just by coming in our door. It is our job to take him or her from where they are to the ability to succeed at the university in what ever major they want to pursue. At LSUA, my role has been similar as there are many non-traditional students attending the university in hopes of entering the nursing program who have never had chemistry. Developmental reading, writing, math and even introductory chemistry take greater skill and patience and motivation to teach with the adult learner at a college today. When I was Dean of the Open College in 1995, I introduced SLS 1501 College Success into the curricula to implement at HCC Dave Ellis’ Master Student Program. During the first week of class I have all my students complete several online activities so that in addition to personal data/schedules collected, I can spot potential problems with Time Management, Learning Styles, and Self Discovery from the Student Success Program. I have a method that helps disarm exams and promotes daily study of chemistry through online interactive homework, daily short pretest quizzes, and post testing specific problem areas. From Preparatory and General Chemistry I there is a lot of ‘hand holding’, but General Chemistry II weans them from these methods during the course, and by the time they are in second year Organic chemistry courses they hopefully have developed the daily study habits to succeed in a more traditional chemistry lecture/test environment. I require students to work on a higher cognitive level in Organic, asking them to employ synthesis and critical thinking applications to succeed. However, in all my courses I employ collaborative team study/performance of comprehensive final exams using past examinations put online, utilizing closed book, open study partner to complete the exercise prior to the final. I do use ACS exams throughout the first two years of college chemistry as a benchmark of the success (or nonsuccess) of each class for my self evaluation and improvement through item analysis of each test. When I see a learning problem, I try to find an alternative solution to give the student a better chance at success. Trying to keep up with technology in computer science is a daily problem, while innovations in chemistry instruction occur at a much slower pace. I have conducted a lot of research in the last decade on misconceptions in science teaching, especially chemistry to improve my instruction. One of the first tasks of a faculty member is being the Motivator before being the Expert, or then the Coach, or finally the Evaluator. I have a mastery learning method of Pre/Post testing and using the quiz/exam as a feedback loop for the students to succeed. Active learning strategies and online experiences help bridge the gap to success for the chemistry student. Liberal arts chemistry (or Physical Science chemistry/physics) must not be approached in the same manner as regular chemistry. Students must be stimulated to read and write chemistry. Making chemistry fun through hands-on projects, discovery learning activities, and relevant at home labs is a challenge. One needs to present a course in the affective domain to reluctant students with non-science learning styles. Projects such as the World of Chemistry, Chemistry in Context, or the ChemCom provided excellent modern base materials to accomplish this challenge. I created such a course at HCC, CHM 1020C, Chemistry and Society. With great success, I then developed and initiated an applied physic course for non-science major, titled Man and Energy, at HCC. Currently at LSUA I am teaching a Physical Science Chemistry (PHSC 1001) for education majors using the same approach I use in Liberal Arts Chemistry. A Nursing or Allied Health chemistry course requires a third approach that supports teaching a specific content while making the course relevant from a medical context. This I successfully did at HCC for a decade, before chemistry was dropped from allied health curricula, I taught at the request of the Nursing School all but two of these sections offered and did not have a student fail, who passed all their other classes that term. I adapted my chemistry testing style to their mastery learning process which required a student to retest if a specific level of achievement is not obtained on every test. This evolved to my unique process of pretest/posttest of small segments of an exam I now employ in all my chemistry classes. If a faculty member employs a grading curve or drops the lowest test score, a message is sent to the student that those objectives were not important to master. If given additional chances to prove mastery, then the score achieved the first time on the objective should be replaced by the latest attempt. Teaching Organic Chemistry provides the most satisfaction to a faculty member who may have taken students through their developmental and freshman chemistry experience. It brings together the concepts of bonding, structure, and kinetics for the student to succeed. Usually tackling three dimensional structures for the first time with simple isomer number problems begins the student thinking in a three dimensional chemistry world. I usually do a unit of intro organic in my first semester general chemistry after finishing the unit on bonding and three dimensional structures. Understanding the properties of each functional group, leads to the student to visualize the chemical mechanisms so that by end of the second semester of organic, they should be able to predict organic products given the reactants. Memorization of hundreds of reactions at this point to predict these products proves to be very difficult for the student relying on rote memory processes. At LSUA thea short course in Organic and Biochemistry (CHEM 2414) designed for BSN program for a post RN program has given me an opportunity to return to my first love of teaching Organic. I have been working on online multimedia software to aid the students in this course. 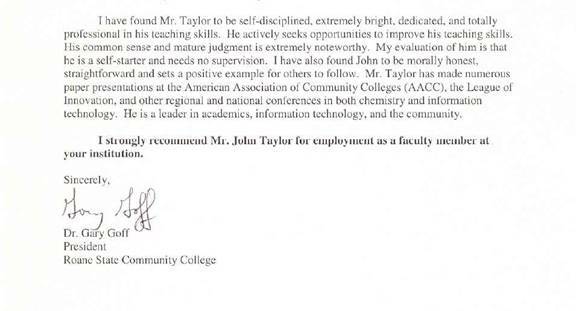 Mr. John Taylor has requested that I provide him with this letter of recommendation. Mr. Taylor has been employed under my supervision at Coastal Georgia Community College as a Part-time Instructor of Chemistry during Fall 2004 and Spring 2005 semesters. In Fall 2004, Mr. Taylor taught two sections of CHEM 1211, Principles of Chemistry I. He is currently teaching two sections of CHEM 1211, Principles of Chemistry I, and one section of CHEM 1212, Principles of Chemistry II, during our 2005 Spring Semester which concludes at the end of April. He has been responsible for teaching both the lecture and laboratory portions of these courses. Mr. Taylor is an excellent instructor with an upbeat personality. He provides a nurturing and positive environment which encourages student learning. He offers help outside of class time to ensure that his students get the needed information. Mr. Taylor is also very technology savvy and uses a great deal of technology in his instruction. He received high marks on his student evaluations. The students like his teaching style and easy going approach. All of his student comments and scores were very favorable. Mr. Taylor is an experienced educator who loves being in the classroom. I hope that you will strongly consider him for your teaching position. If you have questions, please feel free to contact me. I have had the pleasure of knowing John for almost eight years. I have worked with him within the chemistry department and outside the department on special projects and committees. He has the highest of moral character and is a team player. John always tries to do what is best for the department and the college. He shares his knowledge with his colleagues locally and nationally through presentations at various conferences. He has a diverse teaching background. John has taught all levels of chemistry for Hillsborough Community College (Introductory Chemistry through Organic Chemistry), education classes and various computer classes. This diverse background provides him with a wealth of knowledge and experiences to draw upon within the classroom and gives him great flexibility. John's chemistry background is excellent and he consistently implements sound educational practices in the classroom. He is an enthusiastic and engaging instructor. John is a great teacher! John uses innovative strategies within the classroom to try to reach the various learning styles of his students. He has designed computer software to assist students learning difficult chemistry concepts. He integrates web-based learning including on-line homework assignments. When teaching the lower level chemistry courses, he uses a mastery learning approach, which increases student retention. John places student learning first and is very student centered versus teacher centered. He has a great rapport with students and a very fun personality. John will be missed at Hillsborough Community College. I highly recommend John for a chemistry faculty position at your institution. I am certain he will prove to be an asset to your institution. If you need to talk with me personally regarding this reference, you can reach me at my office 813.253.7931 or at home 813.899.1760. Mr. John Taylor has applied for a position at you institution. I said that I would write to you concerning his qualifications. Mr. Taylor and I worked together at the Chemistry Department of Hillsborough Community College, Brandon Campus, from 1996 to 2000. I have a very high opinion of him both as a teacher and as a person. He has an impressive education background in chemistry and in computer science. We shared an office for four years. He was very helpful to me in using computers to supplement chemistry teaching. Mr. Taylor’s enthusiasm was contagious. Whenever I visited his class I could see the interest that his teaching generated. His approach reflected his concern for all his students. He tried different techniques whereby he could reach the intellectually gifted as well as the struggling student. He incorporated humor, the element of surprise and the practical application of chemistry to daily life. He is an innovative teacher who enjoys sharing his ideas with his colleagues. I thoroughly enjoyed working with him and profited from our association. Please consider Mr. Taylor’s application for employment at your college. He will be an asset to your chemistry program. For over three years, I was Mr. John Taylor’s supervising academic dean. John has proven to be an outstanding Assistant Professor of Computer Science and Chemistry for Hillsborough Community College. He has be a leader in both our Chemistry and Computer Science Departments. As the Program Manager (Department Chair) of the Computer Science Program, he supervised over 28 fulltime and part-time faculty each semester. He has received outstanding student evaluations and administrator performance appraisals for the courses he taught. He has a genuine concern for student academic excellence and performance. He has taken a direct role in placing his students and graduates in jobs within the local information technology industry. He developed needed information technology curriculum for five information technology AS Degrees and eight College Credit Certificates. I have found Mr. Taylor to be self-disciplined, extremely bright, dedicated, and totally professional in his teaching skills. He actively seeks opportunities to improve his teaching skills. His common sense and mature judgment is extremely noteworthy. My evaluation of him is that he is a self-starter and needs no supervision. I have also found John to be morally honest, straightforward and sets a positive example for others to follow. He is a leader in academics, information technology, and the community. I strongly recommend Mr. John Taylor as a faculty member at Volunteer State Community College. John Taylor is a superstar teacher and loves the interaction with students. 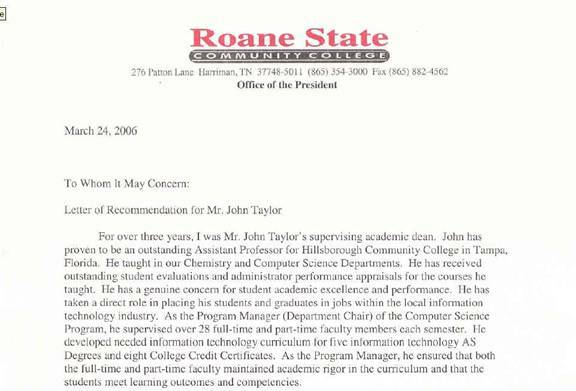 It is with a great deal of pleasure that I submit this letter of recommendation for Mr. John Taylor, who has served Hillsborough Community College with distinction for more than 25 years. In his most recent capacity he has served as Department Manager and faculty member in the Computer Sciences department at the Brandon Campus of Hillsborough Community College. In his previous assignment, he was a valued member of the Sciences Department, and taught various chemistry and life sciences courses. During his long tenure with the college, Mr. Taylor also served as a senior campus administrator, faculty leader, and project grant administrator. In the nearly five years that I have known John, I have come to appreciate his creative and innovative mind. His transition from the Sciences Department to the Computer Sciences unit came at a time in which the department needed a new kind of leadership. That leadership he provided and, as a result, we have a vibrant and growing Computer Sciences Department. He has managed to increase the reach and depth of courses being offered in the unit. He has helped restructure the unit so that programs are coherent and relevant. As a side note, John is perhaps the most creative course development person that I have ever met. His timing is also very well linked to where the industry seems to be heading, and he gets there ahead of everyone else. John has dozens upon dozens of students who have elected to take his courses whenever they hit the schedule. These students understand that the demands he places on them to develop high level skills will make them more valuable to the organizations they are working for or the positions they want to obtain upon graduation. All in all, Mr. Taylor represents that class of faculty who are always innovating and pushing the frontiers of knowledge - especially in the computer sciences. I would recommend him for any faculty position that requires a person with a tremendous amount of energy, creativity, and who is capable of producing results. If additional information is needed, please feel free to contact me at 813/253-7860. Carlos M. Soto, Ed. D.